The tyres are the most used and most underestimated parts of a vehicle. Tyres are very important as the narrow tyre surfaces are the only contact between the vehicle and the road. The service life of tyres is dependent on tyre pressure, driving style handling and fitting. The tyres and wheel rims are an essential part of the vehicle's design. The tyres and rims approved by Volkswagen are specially matched to the characteristics of the vehicle and make a major contribution to good road holding and safe handling. If you have to drive over a kerb or similar obstacle, drive very slowly and as near as possible at a right angle to the kerb. Inspect the tyres regularly for damage such as cuts, cracks or blisters. Remove foreign objects that are in the outer tyre profile and have not penetrated the inner tyre . Always respond to any warning messages given by the tyre monitoring system . Damaged or worn tyres must be replaced immediately . Regularly check the tyres for hidden damage . Never exceed the top speed and load permitted for the tyres that are fitted . Protect the wheels, including the spare wheel, from contact with corrosive substances, including oils, lubricants, fuel and brake fluid . Replace missing dust caps immediately. Tyres with directional tread pattern have been developed to roll in one direction only. An arrow on the tyre sidewall indicates the direction of rotation on tyres with directional tread . The direction of rotation must be adhered to. This is the only guarantee for optimum grip and helps to avoid aquaplaning, excessive noise and wear. If, however, the tyre is fitted in the opposite direction to the tread pattern, you must take more care when driving as the tyre is now no longer being used according to its designation. This is particularly important on wet roads. The tyres must be replaced as quickly as possible or be fitted with the tread in the correct direction. 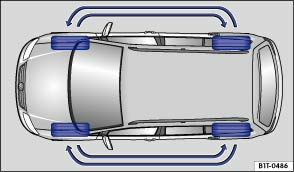 A regular rotation of the wheels as shown in the illustration is recommended to ensure a uniform level of wear for the tyres. All the tyres will then last for about the same time. Volkswagen recommends having the wheels changed by a qualified workshop. The tyres and wheels fitted are of different sizes at the front and rear. Tyres and wheels on the front axle must never be exchanged for wheels and tyres from the rear axle (and vice versa). Volkswagen recommends having the wheels changed round by a qualified workshop . Tyres age through physical and chemical processes which can impair their function. Tyres which are stored unused for an extended period will harden and become brittle more quickly than tyres which are in constant use. Volkswagen recommends replacing tyres which are older than six years with new tyres. This also applies for tyres, including the spare wheel, which appear to still be in good condition and whose tread depth has not yet reached the minimum value stipulated by legislation . The age of a tyre can be determined by the manufacture date, which is a component of the tyre identification number (TIN) . Mark tyres before you remove them to indicate the direction of rotation. This ensures you will be able to mount them correctly when you replace them (left, right, front, rear). When removed, the wheels or tyres should be stored in a cool, dry and preferably dark place. Do not store tyres mounted on the rim vertically. Any tyres without wheels should be protected against dirt and stored standing on the tread. Changing wheels and tyres incorrectly could reduce vehicle safety and cause accidents and severe injuries. It could also invalidate the vehicle's type approval. On the CrossTouran, the size of the tyres and wheels fitted at the front is different to those at the rear. Tyres and wheels on the front axle must never be exchanged for wheels and tyres from the rear axle (and vice versa). Corrosive liquids and other substances can cause visible and non-visible damage to the tyres, which could cause the tyre to burst. Always keep chemicals, oils, lubricants, fuel, brake fluid and other corrosive substances away from the tyres. Old tyres – even if they have not been used – can suddenly lose pressure or burst, especially at high speed, and thus cause accidents and serious injuries. Avoid using tyres that are more than six years old. If you have no alternative, drive slowly and with extra care at all times. Old tyres should be disposed of as required by legislation.